Michael Johnson punches Andre Fili in their lightweight fight during the UFC Fight Night event at Pinnacle Bank Arena on August 25, 2018 in Lincoln, Nebraska. (Photo by Josh Hedges/Zuffa LLC/Zuffa LLC via Getty Images)" align="center"" />Styles make fights. So when Michael Johnson heard that Artem Lobov needed an opponent for Saturday night’s UFC Moncton card, he knew that their styles would make for a fight. On paper, it is a stylistic winner that fits nicely into the co-main event slot in Canada, but behind the nuts and bolts of the fight is the real story, that Johnson really must be settling into life as a featherweight if he is willing to take a short notice assignment in a division he’s only been competing in since the beginning of the year. I can’t stop now... I’ve travelled too far! That’s a good place to be in, but most fighters who make the move south don’t change their out of camp lifestyle too drastically. Johnson has made the complete move to featherweight, and while he admits to being “a little heavy” when he got that call to fight Lobov, he says the weight has been coming off with no issues. And the way he sees it, these days, he will always be down for a fight, whether it’s on eight weeks or eight days’ notice. 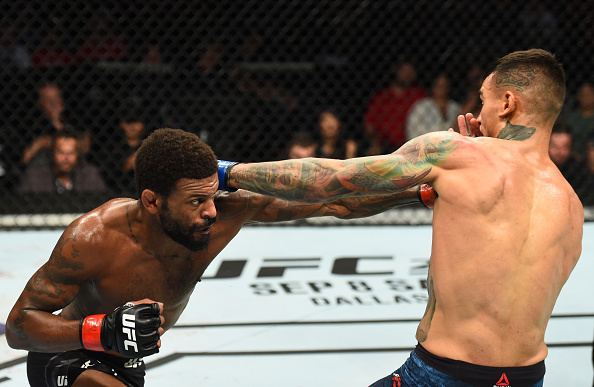 After the move to featherweight resulted in a loss to Darren Elkins in January – his third in a row - Johnson had some winning to do before talking about the prospect of a bright future. In August, he got that win, defeating a tough Andre Fili via split decision. On Saturday, he can make it two straight for the first time since 2015, and that would be a nice way to head off into 2019, but the 32-year-old has a more ambitious plan than that.